Some good things sure take time to get into our hands. We have some good news for UK collectors. 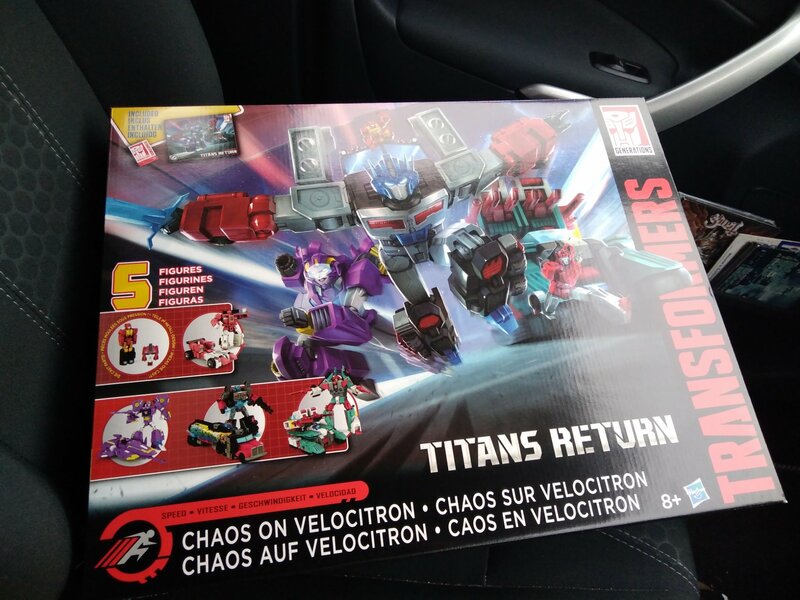 The*Titans Return Chaos on Velocitron Pack Has Been Spotted In The UK. This impressive 5-pack included Leader Class Quickswitch, Voyager Class Laser Prime, Deluxe Class Nautica, Legends Class Fastclash, and Titan Master Rodimus Prime, plus accessories, poster and a collector card. Originally available via ToysRUs and Amazon, this pack finally hit shelves*outside the US and Asia. 2005 Boards user payres*found this pack at Home Bargains in Bury for very affordable £29.99 ($39.25 approximately). The set comes in European packaging. Happy hunting &#187; Continue Reading. The post Titans Return Chaos on Velocitron Pack Spotted In The UK appeared first on Transformer World 2005 - TFW2005.COM.